SKU: N/A. Tags: Buy marijuana edibles, Chocolate Chip Squookie, Heavenly Sweet Chocolate Chip Squookie, edibles. What is a Chocolate Chip Squookie? Heavenly Sweet makes an array of cannabis-infused edibles the delight of medical and recreational consumers across California. Its Chocolate Chip Squookie is incredibly popular, containing an easy and accurate 10-milligram dose of THC per squookie, enough for 10 doses in a 100-milligram pack. Full of chocolate chips, these squookies are exceptionally tasty, powerfully potent, and medically valuable. Infused with an Indica-dominant hybrid strain, Heavenly Sweet’s Chocolate Chip Squookie has tingling effects that relax the body completely, almost numbingly, and last for several hours. Although it can take up to two hours to feel, effects are hard-hitting, powerful, and most suitable for nighttime use. Because of its Indica dominance, these sedating delights are not advisable for work productivity. 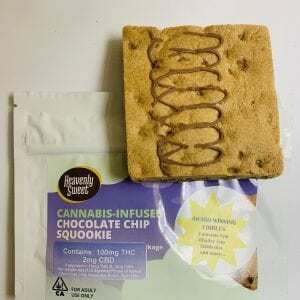 Medicinally, these squookies by Heavenly Sweet contain various cannabinoids, including THC, CBD, and others. This full-spectrum quality ensures patients benefit from the full “entourage effect” of these compounds working synergistically to fight disease. People consume these squookies to treat an array of ailments, from severe and chronic pain to insomnia, appetite loss, muscular issues, anxiety, and more. Because Heavenly Sweet makes the most delicious squookies, they are popular among all in California. Regardless of whether you are eating them medicinally or recreationally, everyone can benefit. Long lasting effects, great chocolate edible!